Hayes & Yeading came away from Kingfield with a share of the spoils against league leaders Eastleigh on this mother’s day afternoon although in all honesty but for a contentious goal from the visitors and a superb save from their keeper at the end it would and maybe should have been a victory for Phil Babb’s side. 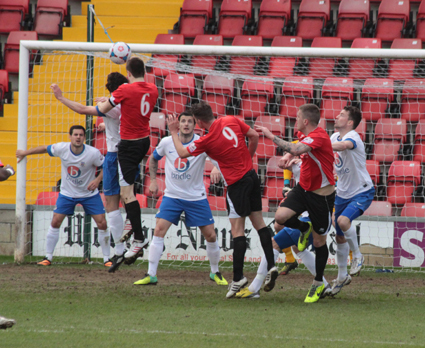 Possession was pretty much even early in the game with neither keeper being tested until the 15th minute when a Jack Mills free-kick from the left side of the Spitfires box curled over the wall but was well fielded by former Yeading FC keeper Ross Flitney. Just a few minutes later skipper Dean Inman rose highest to meet a Samir Bihmoutine corner from the left side, his header going just the wrong side of the upright from a United perspective. With the United defence dealing handsomely with anything the Champions elect threw forwards, it was again the home side who went close, Mills’ long throw being headed down by Freddie Ladapo to Rashid Yussuff who struck a first time volley but again failed to trouble Flitney. Then controversy reigned at the end of the first half, with a minimum of one additional minute being shown, we were well into the second minute when Inman was penalised for what appeared to all apart from referee Mr Eaton to have been a perfect tackle. A free-kick was however awarded, taken a country mile from where the supposed offence was committed and Craig McAllister arrived at the far post to put the league leaders in front as the referee was lambasted by United players, management and supporters alike as he left the field about ten seconds later. 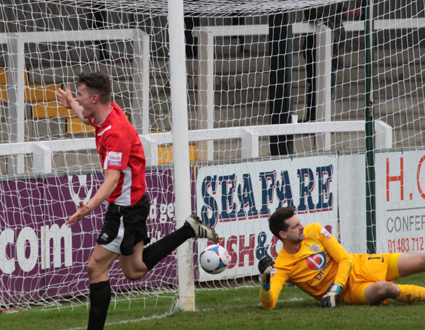 The visitors worked an early opening in the second half as former United striker Ben Wright squared the ball to Jai Reason who scooped the ball over from six yards out much to United’s relief. It was soon the home side taking control of the chances again, in fact the Spitfires didn’t really have another noteworthy effort in the game as Mikhael Jaimez-Ruiz and his defence did well to keep the Spitfires normally rampant attack at arms’ length. The equaliser nearly came on 51 minutes when Pat Cox met a Yussuff free-kick at the far post and although the angle was tight he still forced Flitney to bundle the ball around the post. 20 minutes later though United were deservedly level and again it was that man Cox arriving at the far post (photo below), this time volleying home a superb Mills centre after good build up play from Luke Williams and Yussuff near the right corner flag. As time began to run out a long Jaimez-Ruiz punt was brought under control by Cox who tried to find the top corner from the edge of the box only for Flitney to parry and grab hold of his effort. 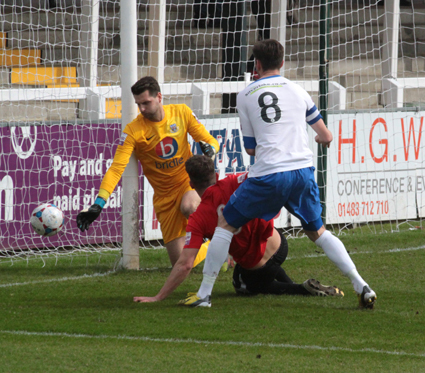 The Spitfires point that goes back to Hampshire was retained in the last minute thanks to a superb save from Flitney. Williams deft touch inside to Cox saw the United striker fire what looked like a perfect shot for the far corner only for Flitney to get enough on the ball diving to his right to take it inches wide of the upright and United had to settle for a point which was the least they deserved.